Shavonte Zellous paced the Liberty against the Wings Friday, with 28 points. Photo by NBAE via Getty Images. 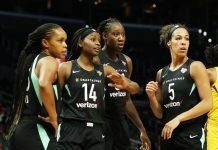 Arlington, Texas – A hard-fought game saw the New York Liberty pull away from the Dallas Wings in overtime to win, 102-93 on Friday night. 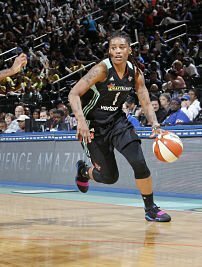 Shavonte Zellous led New York with 28 points, which included a critical jumper to tie the game at 88 with .6 seconds left. The Liberty then dominated the extra period to easily seal the win. 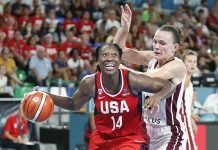 Zellous credited her teammates not only for finding her on the floor, but for turning to center Tina Charles down the stretch, who finished with 25 points and 10 rebounds. “She was getting some big shots, so it’s just when preparation meets……practices and……games,” Zellous said. Dallas was in control until the fourth quarter, when shots stopped falling and they began to lose the rebounding battle. New York made up a 12-point deficit and forced the overtime. Skylar Diggins-Smith led the Wings with 23 points, while Allisha Gray added 16. Dallas coach Fred Williams said that most of the improvements the team needs to make in order to string some wins together are mental. “A lot of it is watching film, getting some walk-through stuff and just hanging in there, just staying at it,” Williams said. The Liberty played a great two-man game with Zellous and Charles. They also had help from their shooters – Sugar Rodgers with 19 points and and Bria Hartley, who scored 17. Combined, they shot 52 percent from beyond the arc. Charles said abandoning zone defense aided them in getting the win. The Liberty are now 7-4, and the Wings fall to 4-8. Dallas, who just returned from a road tirp, needs rest and time to heal. The team is playing one of the toughest schedules in the league, and will notch 11 games by month’s end – 4-6 more than other teams. Williams said every team in the league goes a little struggle and a little strain. “For us, we just have to find a way to win the war on the boards and also to get the hustle plays. That is the main thing,” he said.